Saxophonist Ray Zepeda lets the cat out of the bag. This is a late-night gig for both of us. 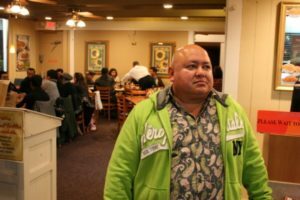 Residing in Hermosa Beach, Zepeda has just driven back to the South Bay from his day job in Bakersfield where he’s a project manager in the oil and gas industry. It’s a long haul, and I bet he’s tired. We’re sitting in the back room of a coffee shop that never closes, and a glass of red wine is sitting in front of him. And so, in the third grade, Zepeda was on his way toward giving Midori a run for her money, having begun to study the violin by way of the Suzuki method wherein one learns to play by ear before beginning to read music. “Then in the fourth grade,” he continues, “the band director at the school went around to recruit kids for the elementary school band. They did a demonstration of a few of the different instruments, and I loved the way the saxophone looked.” In his eyes it had a stunningly complex and complicated appearance, and he liked how the keys adorned it. “So I chose the saxophone, not knowing that my father had been a saxophone player. He had played saxophone all the way through college at USC; he was in the Trojan marching band. But before I was born he’d stopped playing. After he graduated from South High in Torrance, Ray Zepeda headed east, all the way to Boston, to study mechanical engineering at MIT (the Massachusetts Institute of Technology). It was just across the River Charles from the Berklee College of Music. “If you can believe it,” he says, “there was actually a shortage of good horn players at Berklee at the time, so a lot of people (Berklee students) would go to other schools to get horn players for their student projects and recitals.” And it hardly goes without saying that Zepeda himself was often among the recruits. Also, while he was at MIT, Zepeda studied composition with Pulitzer Prize-winning composer John Harbison. Now let’s jump ahead a few years. Earlier in 2012, Ray Zepeda recorded and then released “Step by Step” on the Redondo Beach-based label, Soundsketch Records. There are eight tracks, four originals that Zepeda wrote, and four covers – Victor Young’s “Stella By Starlight,” Johnny Green’s “Body And Soul,” Billy Childs’s “Midland,” and Frank Loesser’s “Never Will I Marry.” Apart from Zepeda, the lineup on the album includes Joe La Barbera on drums, Darek Oles on bass, and Rich Eames on piano. Is this your first CD? When you compose, do you also write out the parts for the other instruments? “To an extent,” Zepeda says. “In the jazz idiom, oftentimes what you can do is give the other instruments what is called the lead sheet, which is basically some melody with the chord changes written above it, and it kind of explains the feel that you’re going for in that particular piece… and [the musicians] can fill in as needed. The track you’re referring to clocks in at ten minutes, twenty seconds. How much time did you spend writing it? “‘Step By Step’ was written over a matter of a few weeks,” Zepeda replies. This was followed by the labor-intensive task of copying out the parts so that the other musicians could read them. As for the other originals, “Most of them took about a week [to compose]. The ones that I didn’t write but arranged took about a week also,” he says. On the album you play alto, tenor, and soprano saxophone. What is the difference between them and how do you decide which one to play on which selection? 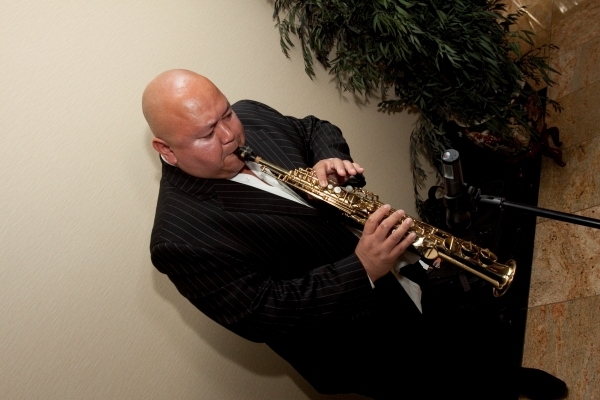 Zepeda notes that many saxophonists prefer to specialize (or focus) on one type of saxophone. “I didn’t want to do that,” he says. “I like having a palette of colors to choose from. For me, a certain horn will work better to capture the mood of a certain tune given its range, its tempo, its level of energy. I prefer more straight-ahead bebop material, for example. I tend to favor the alto for the more contemplative, ECM-type of jazz. The soprano fits very well for kind of the more Coltrane-derivative jazz or funk-based music.” The tenor sax, he adds, is a good partner when playing ballads. Are your intentions to write more music and make more records? Zepeda says that’s what he’ll do. “I’m going to make all the rookie mistakes on this first record… The record has been played in major markets all over the United States, even in some foreign countries, and I’m using that exposure and trying to get into jazz festivals.” Speaking of which, Zepeda performed this past year at the Bakersfield Jazz Festival: “People connected with the music,” he says; “I could feel the stillness in the audience and that’s encouraging to me because a lot of the music we played is not on the CD that has been released but will go on the next one. When you play at the Lighthouse, will the musicians accompanying you be the same ones as on the record? Zepeda shouldn’t be pegged as strictly a jazz purist who wouldn’t touch other types of music with a ten-foot pole (or, in this economy, a nine-foot pole). “I’ve done a lot of horn section work in more commercial-oriented music,” he says. “I play in a punk/funk band based in the South Bay called Flowbis. We just dropped our first CD in September; it’s called ‘Fundamentals.’ I would say it’s punk but it’s more funk/Red Hot Chili Peppers, and there’s a two-man horn section, myself on tenor and Kenny Harrison. Zepeda has also played with other notable South Bay groups such as Jeremy Buck, Chris Pierce, and Latch Key Kid. If someone were to say to you, There are a lot of jazz musicians out there, and a lot of jazz CDs, so what makes you and your music something we should listen to, how would you respond? “That’s always the question that every artist has to stand in,” Zepeda says. “How do you compete for radio airplay with Herbie Hancock and Chick Corea? That’s a tough one to answer, but when I listen to my own music it sounds very, very personal, like I’m almost pouring it out of my heart. Yeah, there’s some intellectual construct to it, but even that has kind of an angry edge to it, and there’s some music that has a very caressing kind of touch to it. 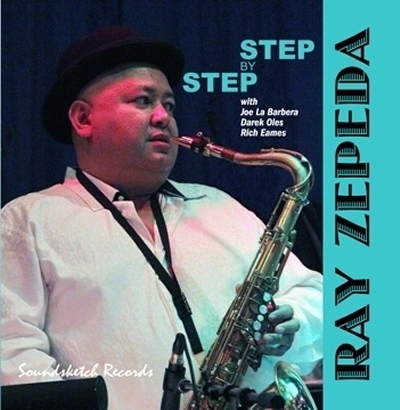 Copies of “Step by Step” are available from cdbaby.com/cd/rayzepeda. Ray Zepeda performs with his band from 11 a.m. to 3 p.m. on Saturday at The Lighthouse Café, 30 Pier Plaza, Hermosa Beach. Step by Step will be available for purchase. No cover. (310) 376-9833.